OpenBTS software enables off the shelf equipment to be used to connect existing GSM phones via VoIP at a fraction of the cost and energy needed for a traditional base station. 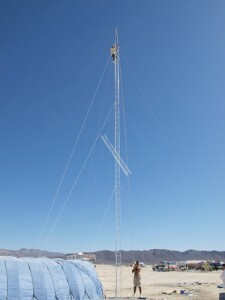 For the third year in a row the system is getting field tested at the art and culture festival, Burning Man, held in the remote Black Rock Desert of northern Nevada. 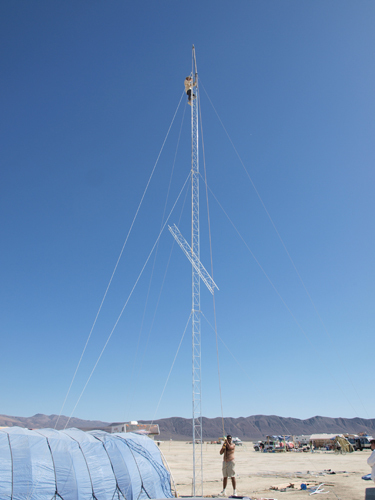 The installation features a 90’ antennae capable of providing voice and SMS coverage across 20km range to the thousands of attendees. The whole set-up also only consumes about 50 watts of power making solar energy a viable option. OpenBTS isn’t the only project looking to expand coverage in underserved areas, VillageTelco has recently begun production of their Mobile Potato nodes. These rugged devices combine the wireless antennae with the firmware needed to create wireless access points. Once installed throughout an area they can provide voice or data coverage at minimal cost. The great part about the design is that they are simple enough for a local entrepreneur to build their own network. One of the biggest hurdles for those interested in providing coverage is conflict with traditional network providers over spectrum rights. Even if an operator were to run a system in an area with no coverage they would still in many cases have to obtain permission from the national regulator. The hope of course is that regulators will realize the value of allowing areas to provide their own coverage without having to wait for outside assistance.